When Gavin Verhey was eleven, he dreamt of a job making Magic cards—and now as a Magic designer, he's living his dream! Gavin has been writing about Magic since 2005. There are a lot of amazing, famous Pro Tour moments. The called-shot Cruel Ultimatum. The "million-to-one" Ignite Memories. And, of course, the Lightning Helix heard around the world. But while those are exhilarating, the most mind-expanding for me comes from the quarterfinals of Pro Tour Nagoya in 2005. It's not nearly as flashy. There isn't a roaring crowd. What happens is extremely subtle. And watching it entirely changed how I think about Magic. Here's the setup, wherein I tell you the story while forcing you to recall as few oddball Champions of Kamigawa Draft commons as possible. 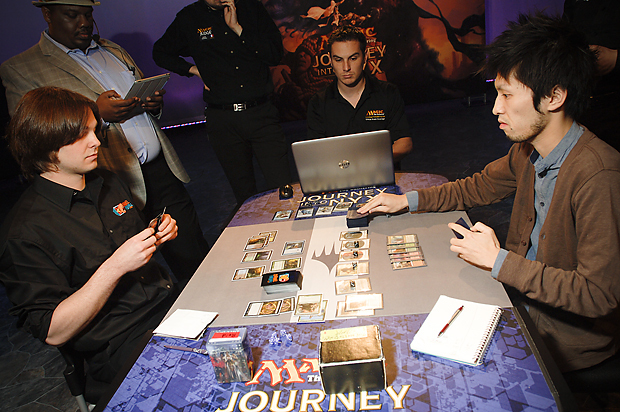 Terry Soh (left) faced off against Frank Karsten (right) in the Top 8 of Pro Tour Nagoya 2005. Malaysian pro player Terry Soh is up against eventual Hall of Famer and Limited mastermind Frank Karsten. It's deep in the late turns of Game 4, with Terry at 8 life and Karsten at 9. If Terry wins here, he takes the match! Karsten makes an attack. Terry blocks, not using all of his creatures and purposefully letting 7 damage pass through, which would take him down to 1. This is the one Kamigawa block common you need to know here. (If you draft Champions of Kamigawa, I highly recommend picking it.) And Frank has one in play. Now here's what it all comes down to: if Frank taps the Moth to pump up his unblocked attacker, he deals an eighth point of damage and he wins! So Karsten is thinking about what to do. And that's when Terry says it. "I have 9 life, right?" Karsten thinks some more. Terry picks up his paper. He asks, "Damage?" Seconds later, Karsten finally taps the Moth. And like a lion pouncing on a zebra that finally strayed from its herd, Terry then plays a trick to gain exactly 1 life, barely surviving. He attacks for the win next turn. But here's the thing: Terry knew he was at 8 life. He made it seem like he made a mistake on purpose to push Karsten toward using the Moth. Now, you can debate the merits of the bluff or double bluff. You could argue that the play would have ended up the same either way if Karsten had just kept thinking. And if you want to delve deep into the thinking behind the exact play, Terry Soh wrote a great article detailing the entire setup to it, wherein you can get the full Champions of Kamigawa Draft common memory recall game experience. But rather than getting mired in the setup of this one specific play, I want to talk about the entire world sitting just behind it if you walk through its enchanted wardrobe. So today, let's take a look at that. Magic is a card game. A lot of strategy focuses on that: how to use any given specific card, what reaction to take to an opponent's action, and so on. A lot of the strategy looks at the cards. Makes sense. Blake Rasmussen doesn't have to be present, but it doesn't hurt. Humans are the ones making the decisions. And humans are flalible. You can easily be fooled—not only by your opponent, but just as easily by yourself. These are elements that seem outside of the game, in that they're not pieces of Magic. But "outside the game" is really still part of the game. Let's talk about three of these human elements that can have a tremendous impact here. A verbal cue is something we say that indicates something to others. When Terry asks Frank Karsten if his own life total is 9, that's a verbal cue. That indicates that he made the choices he did this turn because he believed he was at 9 life. That makes it seem like he made a mistake, rather than an intentional choice to put himself up for lethal damage. Now, before I go deeper here, I want to be very, very clear about something: you should never lie about the game state. It could be easy to follow this path to the dark side, where you instead start claiming you actually are at 9 life and trying to get that point added to your life total. It's a razor's edge. There are all kinds of verbal cues we give in a game, which can either provide information or plant the seeds of a future mistake. Let me give you an example of how one sentence can cue an entirely different thing if just said at slightly different times. If I ask you how big your Tarmogoyf is, then attack my smaller creature into it, what do you think is happening? Take a moment and come up with your answer. Now, let's change it slightly. If I attack my smaller creature into your Tarmogoyf, then ask how big it is, what do you think is happening? In the first example, where I ask first, that indicates I have something to deal with your Tarmogoyf, such as a pump spell or a burn spell. I am attacking with the knowledge of your Tarmogoyf's size. I've made sure you know that I know how big it is, so this can't be a mistake. On the flip side, in the second example, it looks like a textbook mistake! I attacked into your Tarmogoyf, then told you that I didn't know how big that Tarmogoyf was. Clearly, I made an error! See the big difference? And that's one sentence, said just between one action and the next, which leads to a radically different assumption. Words, and when you say them, matter a lot. If you think we say a lot, that has nothing on nonverbal cues. Have you ever found that in text messages and online discourse it's harder to strike the right tone than in person? Well, you're not alone. Psychology professor Albert Mehrabian once famously coined "the seven-percent rule," noting that only seven percent of all our communication has to do with the actual words we say. And while that number and the use of it has been debated up and down, even if his studies were wildly off and the words we say are all the way to up 50% of communication, that's still 50% of communication that takes place in other ways! Body language. Tone of voice. Engagement in the conversation. Those can all be lost in text. But the advantage of playing Magic in person is that you have access to all of those. When I ask, "Are you hungry?" and I'm rubbing my stomach in excitement, that definitely indicates I am hungry too. There's no mystery there, unlike the verbal cue that left some room for interpretation. It's a nonverbal cue. Let's go back to the Soh and Karsten game from earlier. There's one thing from it I haven't talked at all about yet. It's one of the oldest tricks in the book. And it was at play there. While Karsten was still thinking, Terry picked up his pen and paper. This nonverbal cue very loudly says "Let's go to damage." Against some players, picking up your pen says let's go to damage now. They may forgo activating a trick or thinking longer about some on-board effect. This has been something that you see happen for ages. It's one of the first big nonverbal cue "tricks" people discover. Going a level deeper, though, you'll notice that this had the exact opposite effect on Karsten! That's right. If you recall, within moments of Terry picking up pen and paper, Karsten activated his Moth. And it's precisely because it's such a common tell that someone wants to go to damage badly that Terry knew it would indicate to Karsten he should do the exact opposite. That's some second-level play for you, right there! Because Soh knew that Karsten knew what Soh was doing made it look like he wanted to go to damage, he could actually produce the opposite effect! You're playing against a control deck with Wrath of God. Your aggressive deck is curving out. One-drop. Two-drop. Three-drop. Looking nice! 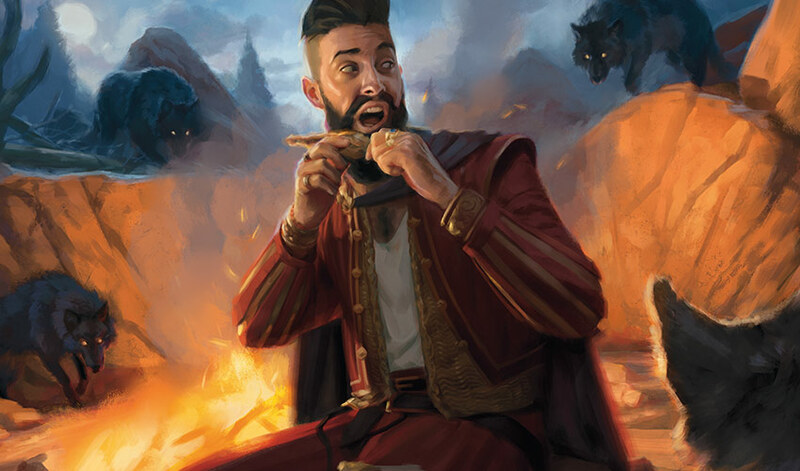 Your opponent misses their fourth land drop, exasperated. They discard to their turn and sigh. Smelling blood in the water—following our basic, hunter human instincts—you pounce and unload your hand of creatures to generate lethal damage next turn. If they don't draw a land, you're a lock to win!
. . . Then they untap, play the land they were holding the whole time, and cast their board sweeper, smiling. It was all a ruse to lure you into overextending. Now here's the interesting bit. If you're playing against a knowledgeable player, and they do that exact line of play, you would be inclined to think they might be acting and creating a ruse. So you don't play creatures. But maybe they know that. Maybe they're overacting knowing that you know about this trick. And it's up to you to judge this situation. What do you know about them? What do you know about how they've played? What do you think is going on? And that's all part of the game. While it's not the literal cards, it can determine who wins and who loses just as much. Human memory is pretty horrible. Let's try something. Quickly: Can you recount all the meals you had through the past seven days? What did you have for breakfast, lunch, and dinner each day? Seriously, try it. Can you do it in two minutes? If you nailed it quickly, well done! If it took you a while or you didn't get them all, don't worry about it—a lot of people have trouble with this. There are all kinds of ways memory has been shown to be misleading. People "remembering" things that never happened, and forgetting about things that were quite important. And in Magic, a game with thousands of different pieces and plenty of new cards in any given Limited format, why take the risk? Fortunately, you have a way to store that information: your notepad. If you're playing in a competitive Magic tournament, you're probably using pen and paper to track your life total. And you're also allowed to take notes within a match and refer back to them in that match. If you think of your brain as the computer running the complex, memory-taxing program that is Magic, your notepad is a way to offload some of that memory usage. So, for example, if you cast Duress on your opponent, why not write their whole hand down? Yes, you probably could remember each card . . . but why chance it? And why spend time remembering that when there's so much else to think about? And you can take this a level further. Something Frank Karsten innovated (or at least popularized) was the idea of writing down all the cards your opponent played in a game of Limited to refer back to in Games 2 and 3. It's important that you don't take forever doing this—your notes need to be made in a timely fashion—but it is a tremendous way to help yourself out. "What did they have last game? Did they have Sure Strike? Or was that my last red opponent? Wait, is Sure Strike in this set or is it Thunder Strike? What did I eat for lunch yesterday? What are my life choices? Oh no!" "Well, let me look at this list to know for sure every card they've played so far. Yep, looks like their deck does have it—and Crash the Ramparts, too! Hmm, good to remember." I don't know about you, but I would strongly prefer the second direction. One side comment on this is that you can't refer back to those notes in later matches, so don't plan on using notes from one match to reference in a future one. But as long as notes you make in a match remain entirely contained within the same match, you're good. Magic is a complex game. For most people, it's easier to offload those extra mental tasks where you can and focus on the parts that really matter. Everything here might be very exciting, and you may already be thinking of how to apply it to improve your game. And that's great! But I will leave you with one word of caution. At the end of the day, just having a good core understanding of the mechanics of Magic is going to be far, far more relevant than many of these. Bluffing is exciting. Figuring out what your opponent has is exciting. These are parts of Magic that people tell amazing stories about. But you will win a lot more games of Magic just by playing well. These are ways to turn around that five percent of games that you wouldn't win otherwise. Instead of spending hours poring over Tarmogoyf flow charts that are titled "When Is the Best Time in a Turn to Ask How Large a Tarmogoyf Is," those hours are usually going to be a lot better spent working on fundamentals. With that said, knowing the basics of what makes these "outside the game" elements work can let you figure out how to apply them on the fly. And really, every situation is different. There's no playbook that Terry Soh pulled "I'm at 9 life, right?" out of. He came up with it on the spot. Like when building new Magic decks, creativity is required. Hall of Famer, noted attack bluffer, and current Wizard of the Coast Mike Turian was once asked if he had ever played a perfect game of Magic. He said no without hesitation. "So much as a blink at the wrong time could disqualify you from playing a perfect game of Magic." Everything is part of the game. Remember that. I'd love to hear what you thought about this article. Please let me know! You can reach me by sending me a tweet, asking me a question on my Tumblr, or sending me an e-mail (in English, please) at BeyondBasicsMagic@gmail.com.